This is our reference NY-15791. 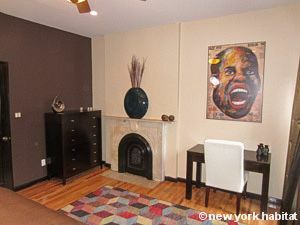 This is a renovated one bedroom apartmentwith an extra sleeping alcove in central Harlem, Manhattan. 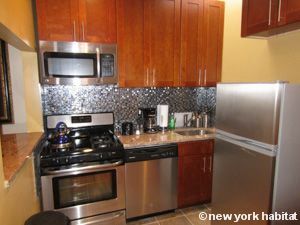 Located on 128th Street and 7th Avenue, this apartment is conveniently close to parks and subway stations, as well as the famous Lenox Avenue! 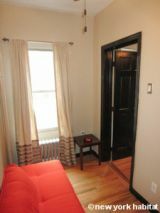 It is situated on the top and 4th floor (considered 3rd in Europe) of a prewar walk-up townhouse. 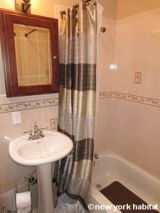 This renovated home includes an ideal layout for privacy with fully-furnished rooms. 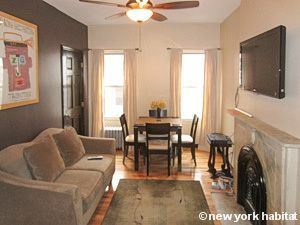 Scattered around the thoughtfully painted apartment is unique artwork and eclectic area rugs laying atop hard wood flooring. In the living room, a two-person sofa faces a flat-screen cable television hanging atop a decorative fireplace. Two large windows with long white curtains face the courtyard, accommodating natural light and easy ventilation. The compact alcove (living room 2) is attached to the living room. 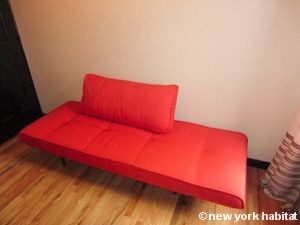 It provides a bright red single-sized sofa bed, cabinet and closet space, ideal for a guest or renter with minimal belongings. Separating living room 1 and 2 from the master bedroom are the kitchen and private bathroom. 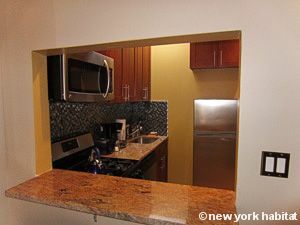 The tiled kitchen includes granite countertops and stainless steel appliances, as well as a opening to the living room that allows for conversation while preparing meals. 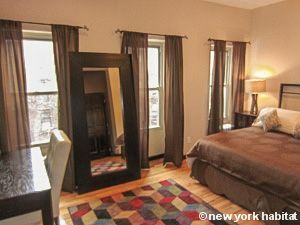 The master bedroom (Bedroom #1) extends 180sqft (approx 16.7sqm) and includes the luxury of a king-sized bed. Three large windows line one wall and allow natural sunlight to saturate the indoor space, looking towards the townhouses lining the opposite side of the street. One desk with chair allows convenient completion of workloads and recreational activities and a decorative fireplace adds personality to the charming sleeping space. For public transportation around Manhattan and into other New York City boroughs, walk to 125th Street and Lenox Avenue for the 2 or 3 trains (0.3mi/450m). Additionally, you make walk to 125th Street and Saint Nicholas Avenue for the A, B, C, or D trains (0.4mi/700m). Both of these subway stations have express and local trains, allowing you to make the most direct trip possible!